The Global Volcanism Program has no activity reports for Antipodes Island. The Global Volcanism Program has no Weekly Reports available for Antipodes Island. The Global Volcanism Program has no Bulletin Reports available for Antipodes Island. The isolated, uninhabited Antipodes Islands are located in the south Pacific, 770 km SE of New Zealand. Volcanism has been dominantly pyroclastic, and the presence of well-preserved scoria cones suggests a Holocene age (LeMasurier and Thomson, 1990). 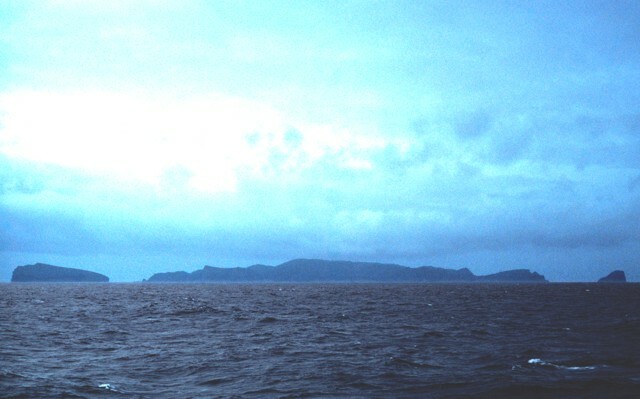 The most recent eruptions occurred on the cone forming Mount Galloway and Mount Waterhouse at the center of 4-km-wide main island. Marine erosion has exposed sections through tuff cones at Perpendicular Head and Albatross Point at the NE and SE tips of the island, respectively. Radiometric dates indicated basalts that are younger than 1 million years (250-500 ka with high uncertainty W of Reef Point), and Cullen (1969) also speculated that volcanism may have begun in the Tertiary and persisted "almost to the present day." This volcano is located within the New Zealand Sub Antartic Islands, a UNESCO World Heritage property. Cullen D J, 1969. Quaternary volcanism at the Antipodes Islands: its bearing on structural interpretation of the southwest Pacific. J. Geophys. Res, 74: 4213-4220. Warham J, Johns P M, 1975. The University of Canterbury Antipodes Island Expedition 1969. J Roy Soc New Zeal, 5: 103-131. The Global Volcanism Program is not aware of any Holocene eruptions from Antipodes Island. If this volcano has had large eruptions (VEI >= 4) prior to 10,000 years ago, information might be found on the Antipodes Island page in the LaMEVE (Large Magnitude Explosive Volcanic Eruptions) database, a part of the Volcano Global Risk Identification and Analysis Project (VOGRIPA). There is no Deformation History data available for Antipodes Island. There is no Emissions History data available for Antipodes Island. The Global Volcanism Program has no photographs available for Antipodes Island. There are no samples for Antipodes Island in the Smithsonian's NMNH Department of Mineral Sciences Rock and Ore collection. Large Eruptions of Antipodes Island Information about large Quaternary eruptions (VEI >= 4) is cataloged in the Large Magnitude Explosive Volcanic Eruptions (LaMEVE) database of the Volcano Global Risk Identification and Analysis Project (VOGRIPA).